The leader of the Indigenous People of Biafra, Nnamdi Kanu, has urged Igbo people living in the North to relocate to their homeland. He spoke in reaction to a newly-released anti-Igbo song circulating in most northern states. 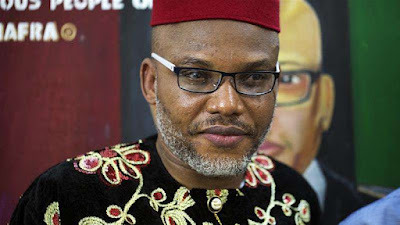 Kanu, who gave the come-back-home advice while speaking with journalists in his Afraukwu Umuahia country home, said the song was only a prelude to the October 1 quit notice by Arewa youths. He described the anti-Igbo song as “evil, satanic and pre-genocidal,” and warned Igbo people in the North not to ignore the grave implications of the messages conveyed in the song, adding that the song was a further confirmation of the alleged plots to kill the Igbo living in the North. Kanu said, “I am aware of an anti-Igbo song circulating now in the North. My reaction has been to warn our people in the North that the pogrom being hatched by our enemies will come. There is an impending doom for our people living in the North. » Northern Youths Give Igbos In The North, 3 Months To Leave?